Dosbat: The Causes of Arctic Amplification. Screen et al were concerned with separating out warming due to, changes in sea ice and resultant sea surface warming, changes in sea surface temperature in oceans outside the Arctic, and direct radiative forcing from factors such as greenhouse gasses and the sun. They used reanalysis data to give a set of observations. Reanalysis data are produced from weather models which assimilate observational data, so the weather model's physics basically fills in the gaps where there are no observations. The result is that reanalysis models produce the sort of detail in time and space needed to examine changes in a region like the Arctic, where observational data is patchy. This however raises the question of whether reanalysis can be trusted. Graverson et al published "Vertical structure of recent Arctic warming" (PDF) in 2008, they showed using the ERA-40 reanalysis dataset that the recent Arctic warming was due to influx of warm air from mid latitudes. However as Screen et al note, subsequent studies showed there to be a problem with ERA-40. On the basis of the ERA-40 reanalysis, Graversen et al. found greater warming aloft than at the surface over the period 1979-2001, which led them to conclude that atmospheric poleward energy transport, not Arctic sea ice loss, was the main driver of AA. In contrast, alternative reanalysis data sets analysed by Serreze et al. and Screen and Simmonds [2010a] showed strongest AA at the surface, consistent with changes in the surface energy budget due to sea ice loss [Screen and Simmonds, 2010b]. This discrepancy can be explained by two compounding factors: errors in ERA-40 that result in exaggerated warming in the mid- to lower-troposphere [Screen and Simmonds, 2011; Alexeev et al., 2012], and an increase in the rate of sea ice decline [Comiso et al., 2008], that has strengthened surface-based AA over the past decade [Serreze et al., 2009; Screen and Simmonds, 2010a]. Screen et al use four reanalysis products and the average of those products to examine the cause of recent Arctic atmospheric warming, and the Arctic Amplification which is caused by that warming. They also use the outputs of two GCMs (General Circulation Models aka Global Climate Model), carrying out two experiments with the models. GLOBAL (or GLB) uses a set up where land conditions are free to evolve, but observed ocean temperature and sea ice concentrations are used for the ocean part of the model. ARCTIC (or ARC) uses a set up where land conditions are free to evolve, but the sea surface temperature outside the Arctic is set to the climatological cycle. Within the Arctic observed sea ice concentration is used, with observed sea surface temperature where the ice recedes to reveal open water. Using these two datasets, GLOBAL and ARCTIC it is then possible to determine the temperature response of the Arctic atmosphere to changes within the Arctic and outside the Arctic. Above is figure 3 of Screen et al. 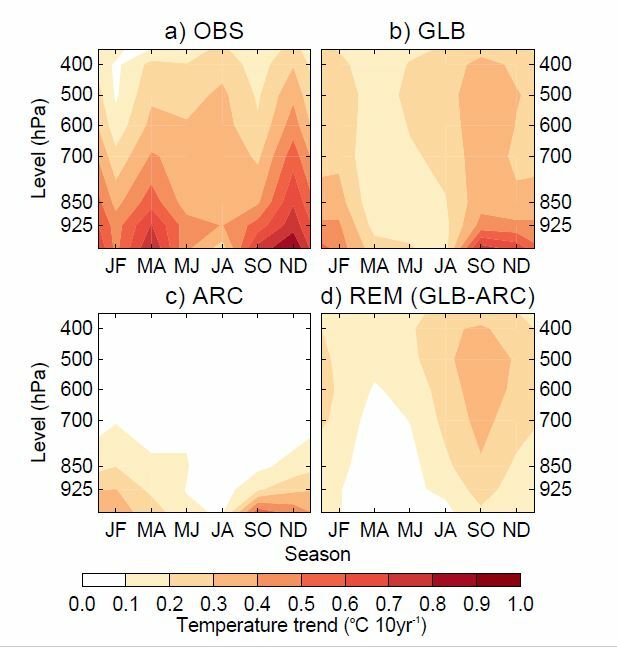 Note that there are six 'seasons' used in this study, two month seasons are used because using the more typical three month seasons loses detail in the rapid changes within the year. The panel labelled OBS is the average of the four reanalysis datasets, GLB and ARC are the GLOBAL and ARCTIC model derived datasets detailed in the bullet points above. For comparison of the model and reanalysis results see the source paper. By subtracting ARC from GLB Screen et al derive the remote response, REMOTE (REM); the warming of atmospheric temperature in the Arctic in response to sea surface temperature changes outside the Arctic. The differences between GLOBAL and OBS are notable, part of this is the lesser lower level warming in March/April which the authors attribute in part to the overly strong temperature inversion in the models. Normally surface temperatures decrease with height, called adiabatic lapse rate, however during an inversion temperatures increase with height for some layer above the surface. This is a common climatological factor in the Arctic because the surface radiates heat into the cold, dry, atmosphere and is able to cool below the temperature of the air above. It is a known problem in GCMs that most models create an inversion that is too strong, as I've discussed previously. ARCTIC suggests that during the autumn and winter there is a lower level warming due to loss of Arctic sea ice, which is stronger in autumn than in winter. This warming is occurring because the loss of Arctic sea ice is acting to shift the energy distribution of the seasons. During summer more open water absorbs more heat, and more ice melt takes up more energy, the energy it takes to melt ice keeps temperatures during the summer from increasing markedly. This latter effect is identical to the way ice keeps a drink cold, until the ice is melted the temperature of the drink remains near zero, this is because the energy that would otherwise go into warming the drink up goes into melting ice. During autumn not only is the heat gained in open water during the summer released, but effectively the energy taken to melt the ice is also released, the input of this energy into the atmosphere warms the lower atmosphere through autumn and is then radiated into space. Over the rest of the winter thinner ice still thickening release heat by virtue of not being as thick as the ice once was. Screen et al note that the surface based warming in the GCM experiments may not be as great as in OBS partly because of the inversion problem. REMOTE suggests that influx of warmer air into the Arctic is occurring which is warming the troposphere above the surface. Notably this accompanies the autumn warming, it may be tempting to assume that this could be due to the low level heating, but because of the way REMOTE is calculated this cannot be the case, it must be due to changes in SST outside the Arctic. This signal must be due to sea surface temperature changes outside the Arctic, but are these observed temperatures outside the Arctic showing in turn a remote signal from changes in the Arctic? Screen et al carry out a further experiment in one of the GCMs, this is called ALL. In ALL the ocean is specified as in GLOBAL, but the model is also forced with "the observed evolution of greenhouse gases, ozone, sulphate and volcanic aerosols, and solar output." This doesn't 'double count' because the oceans being specified from observations do not respond within the model to these forcings. The model output of ALL has the GLOBAL temperature profile subtracted from it to give the direct radiative forcing or DRF. 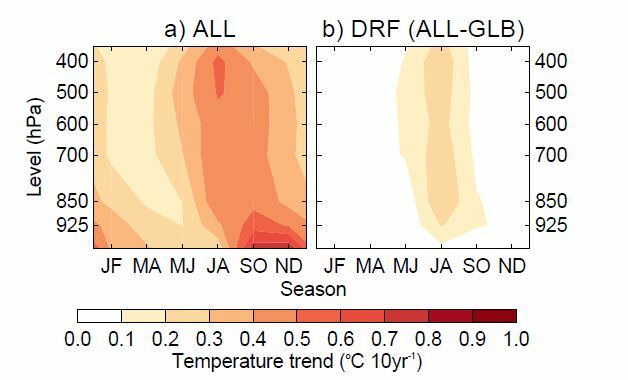 DRF has the largest temperature impact above the surface in summer, once again it should be borne in mind that surface temperature change in summer is limited as long as there is ice to melt. That isn't to say there is no impact outside the summer, it's just found to be less than 0.1degC/decade. Screen et al use the GCM studies to examine the relative roles for sea ice changes and remote (outside the Arctic) sea surface temperatures, they find the contributions to be about 50% and 17% respectively at the surface. While at mid troposphere almost all the warming is from remote sea surface temperatures. Arctic amplification is important because it seems to be playing a driving role in Global Weirding, which I see as not directly related to AGW, but as a consequence of the rapid changes in the Arctic. To me it is no coincidence that we seem to have been having weird weather over the last few years, just as Arctic change has really started to accelerate. Given that the profile of warming in the Arctic varies with season and height in the atmosphere, it should be no surprise that the resultant impacts on mid latitude weather vary with the seasons. Furthermore this means that with the changes in the Arctic that are to come, we should not assume our weather will assume a new climatological normal anytime soon.